I have been costuming for some years, and although I gave it up for quite a while, I’ve recently started up again on a small scale. 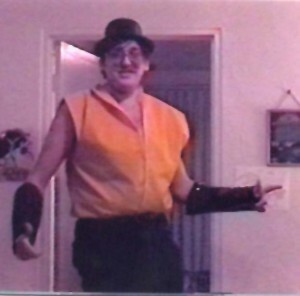 While I honestly am interested in “serious” costumes, I think that making people laugh gives me the most joy, and that probably explains most of my costumes. 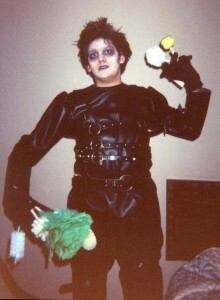 At one time I had something of a reputation for fairly off-the-wall costumes. The costumes shown below are some of my favorites and/or ones for which I have pictures. Some of the ones that are not pictured below were Bruce Wayne’s World (Party on, fight crime, excellent! 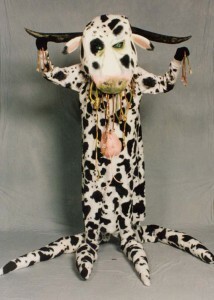 ), The Flash (a costume so fast you couldn’t even see it), Silence of the Lamb Chop (I made a fairly elaborate puppet for this one, and spent a couple of days trying to talk like Shari Lewis channeling Hannibal Lecter, so I really wish I had a photo of that one). There are also a few that I have managed (finally) to forget. (Click on any of the images to view in slideshow mode). Screw up on the beam down – This is one of the first costumes I did – I think that I first wore it at Star Con in Denver in 1990, and then at Costume Con 10 in Nebraska in 1992. It won a spazzy! 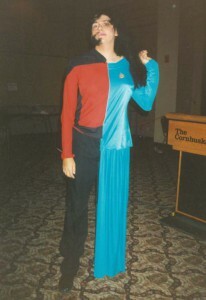 The idea was that Troi and Riker got stuck together in a teleporter accident. Naturally, they got into a fight, and Troi ends up slapping Riker. When Riker complains that it hurts, Troi of course, already knows – “she can feel his pain”. I made the costume, with the makeup done by my friend Heather Harvey (who also helped come up with the idea for this and many others of my costumes). San Francisco Worf – This one was originally called “Mirror-Mirror Worf” – The theory being that, if good guys are bad in the Mirror Mirror world, tough, butch Worf would be a little light in the loafers. The pink in the material was so pink that it was almost impossible to look at directly. The sash was green, covered in rhinestones. The much (in my opinion) better name – San Francisco Worf was yelled out by someone in the audience at Star Con in Denver (1991 ?). I wish I’d thought of it! Nowadays Klingon costumes are pretty common, and there are simple kits for doing the prosthetics. That was not true back then. The prosthetic for the head was painstakingly created in layers by Heather over plasticine while I lay very still for hours. Strangely, before this convention, Klingons were very rare, but at that convention, there were a number of Klingon costumes. My friends Stephen and Marion Clark did some great, very detailed Klingons (back ridges and everything), and there was even a Klingon baby. 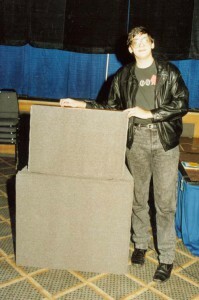 Here is a picture of me and Stephen together. I designed and built the costume with much help from my friend Heather Harvey. 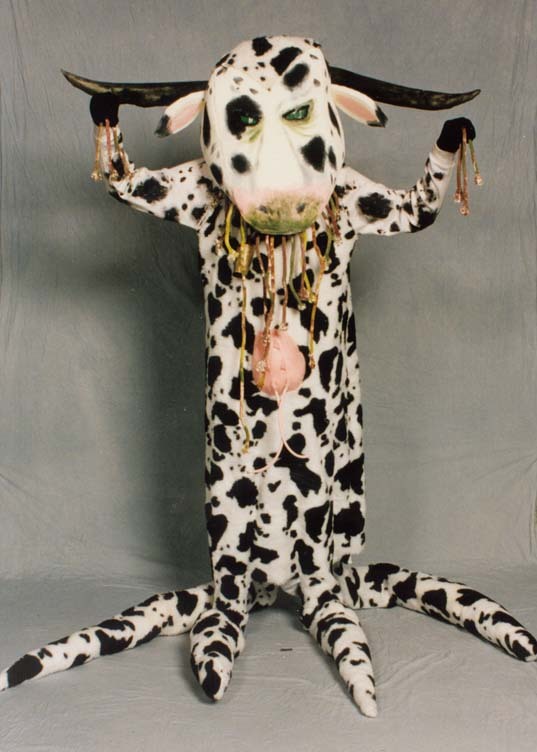 Cowmina Burana was recorded with the help of a number of people including Heather, my (now) wife Anna, my mother and my sister. 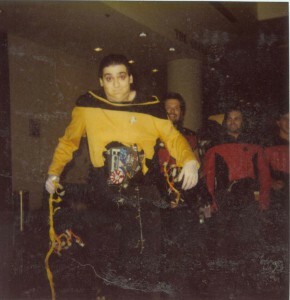 Data Overflow – Hard to see in the picture, but Data’s guts are hanging out – lots of flashing lights and spinning items. On stage, I “threw-up” gears and wires. For some reason, Star Trek just seems to lend itself to parody! Agent 57, Master of disguise – This one takes a little bit of explanation. This was done at a Mile Hi Con in Denver (I think around 29, but I will have to check). 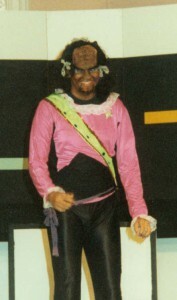 The MC (Rose Beetem – who was in on the gag) went through a number of the costumes. Then, at about costume 23 (ish), she introduced Agent 57, Master of disguise – at this point, the podium she was standing behind got up and left. I had built a (much lighter) replica of the Sheraton’s podiums, and was hidden inside. In fact, I was inside for about an hour before the costume contest, and my legs had cramped so badly that I almost collapsed on the front row of the audience. My replica of the podium was so good that the hotel wouldn’t let me leave with it – they were convinced it was one of theirs!! The Spocketeer – The picture is pretty lousy, so some explanation is needed. In 1991, there was a movie called The Rocketeer, in which the hero flies about using a jetpack, and wears a helmet with a fin down the middle. 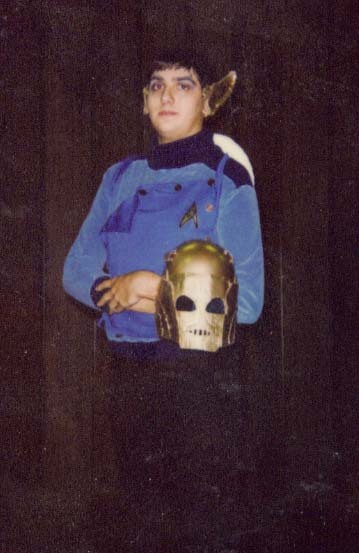 When I first came out on stage, it looked like a similar helmet, but with two fins. However, when I took off the helmet, it became obvious that the fins were actually my ears! Here is a picture with the helmet on. The rocket pack, of which I unfortunately don’t have a picture, was, of course, a model of the Enterprise. Not quite sure why I was so bad at getting pictures — I suspect that there are much better ones lying around of a number of these costumes, but we were usually so busy getting things made in time, that we forgot about the photos — less of a problem now when everyone’s phone is also a camera. Edward Dishpan Hands – Edward turns in his scissors for cleaning implements – mops, dusters, etc. 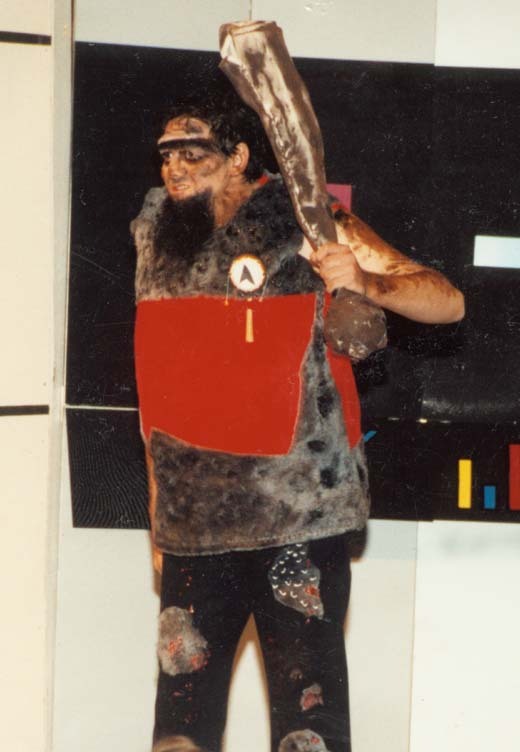 When I wore this costume on stage at a Mile Hi Con, I started dusting around the judges’ table, and accidentally knocked over a pitcher of water – fortunately, I managed to stay in character, and used the mops to frantically clean up the mess. This costume was literally created the night before the convention, with Heather doing the makeup. A Company of Wolves – This is by far the most complex costume we’ve ever done (so far). 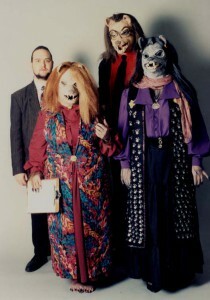 The masks are foam latex over an articulated fiberglass shell. The mouths worked, and had proper dental-quality teeth. It took us months to make, starting from a head-mold (of my head), sculpting, reverse molds, etc. 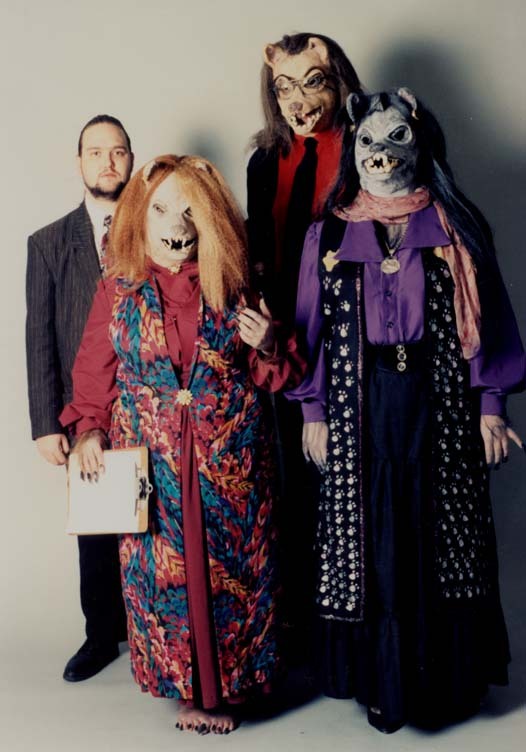 The presentation involved a slimy lawyer (Joe Bilodeau on the far left – no mask) talking about how wolf-like their firm was, and how they would have no trouble dealing with this new law-firm (the rest of us, in wolf-masks). I am the wolf in the background. Anna Wood is on the left, and Heather Harvey is on the right. 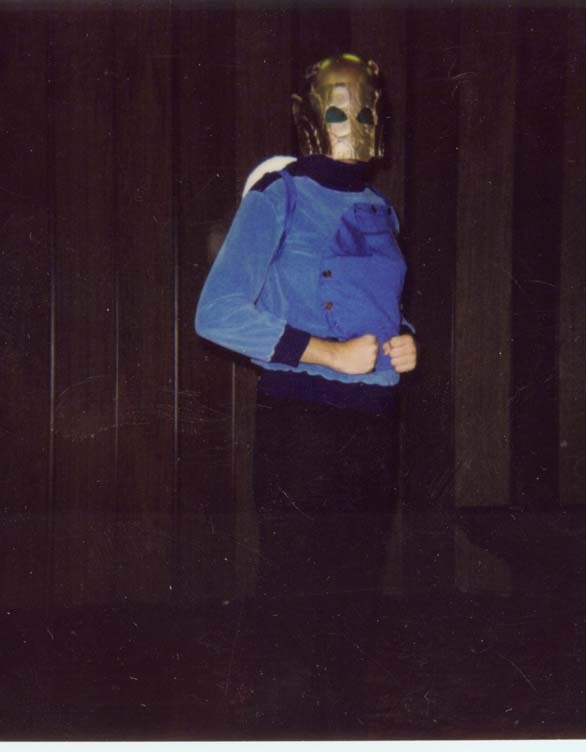 We took this one to a couple of conventions, but didn’t do too well (I think that a number of judges thought that the masks were store-bought). Star Trek, The First Generation – Fur uniform, tom-tom communicator and club-phaser (actually shot rocks). This one was another quickie that was a lot of fun. 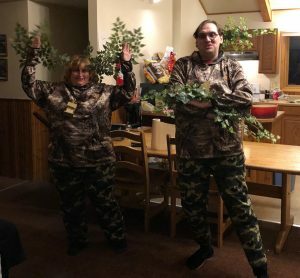 Did this locally and at a Costume Con – in the historical category! Most historical costumes are incredibly detailed, and the Historical Contest at Costume Con requires detailed documentation to back up the costume – I did write up documentation, although it was not quite serious (If I can find it, I will create a link). The most fun part was the pre-contest evaluation. For the historical contest, judges examine the costume in detail, count stitches, check materials, etc. For mine, they were a little bit lost (but took it well). Pushpin Head – From the Hellraiser series, a slightly less serious bad guy – instead of a head full of nasty pins, just pushpins. Instead of shooting nasty chains with hooks at the enemy, he shoots links of paperclips. Did this one for Karval Con, a mini-convention run by my friend Rose Beetem (who also does the programming for Mile-Hi Con). Spent a lot of time latexing push-pins to my head! The picture was taken off of video, so there is no large version, and the small version is almost impossible to see the details – trust me, though – those are pushpins! Hercules Poirot – The hulking hero of Greek myth fame, sporting a bowler hat and a Poirot-style mustache. Another quickie for Karval Con (Thrown together an hour before leaving for the Con – my sewing, however, seemed to go quite well). Apologies for the poor quality of the picture – it is another video cap. 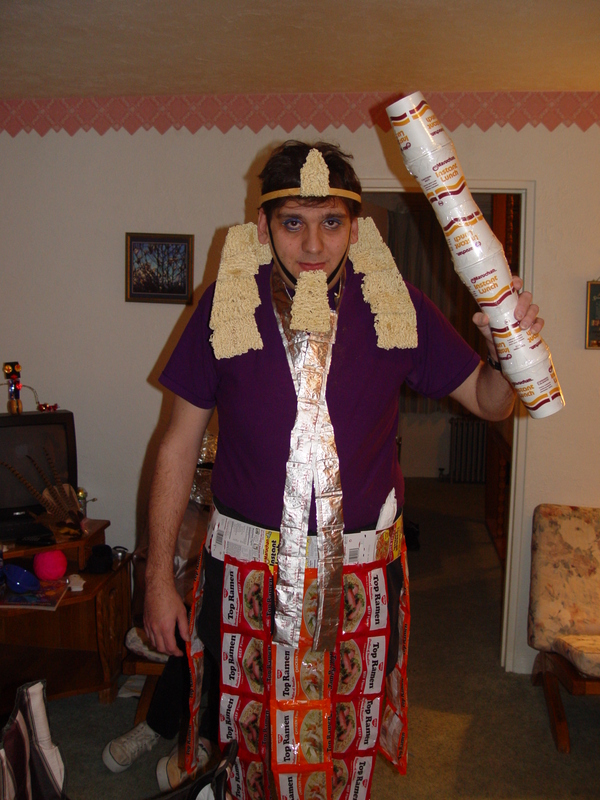 Ramen-Ho-Top – Egyptian god of college students and noodles! Yet another quickie Karval Con costume, but one of my favorites. The beard and head-piece were literally made from ramen noodles, the kilt from the packets, and the sash from the flavor packets. The staff was made out of pot noodle containers. 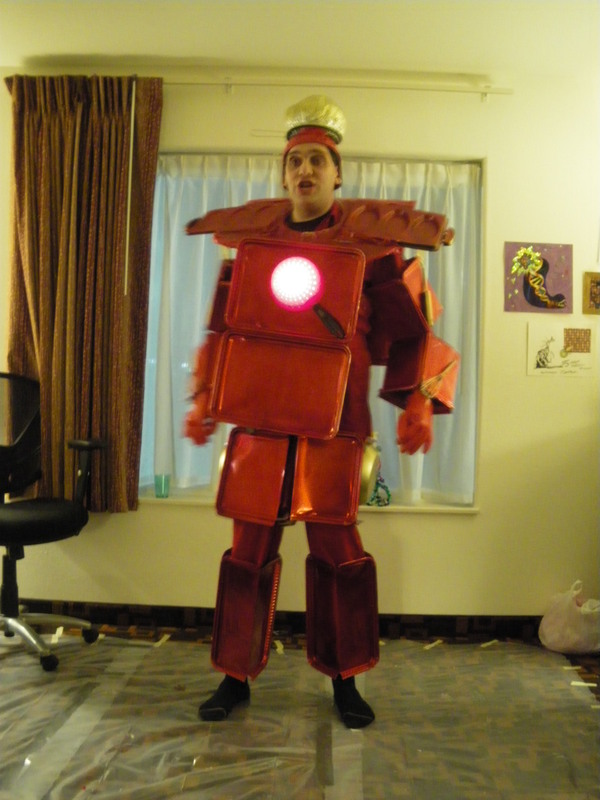 Iron-Chef Man – Tony Stark, international man of cuisine! 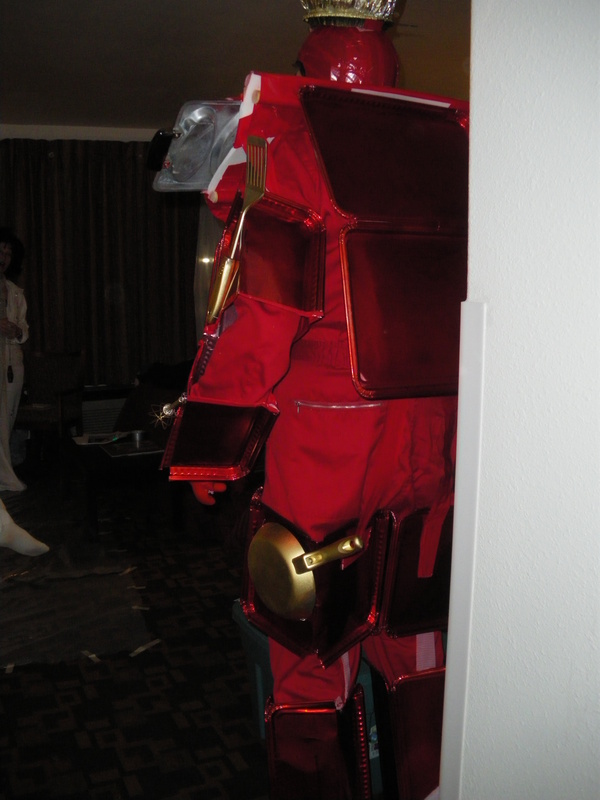 This costume is made entirely out of cooking-related items – the body is made of oven sheets, the shoulders are some sort of waffle iron, the chest piece is a colander, and the head cap is a popcorn popper. There are also various other implements, such as whisks and frying pans, which you can see a bit better in this side view. This one was also done for Karval Kon, but it was so much work that I ended up taking it to Mile Hi Con as well, where I think I won a judge’s choice award. It was enough fun coming out of public retirement that I may well be doing it some more. 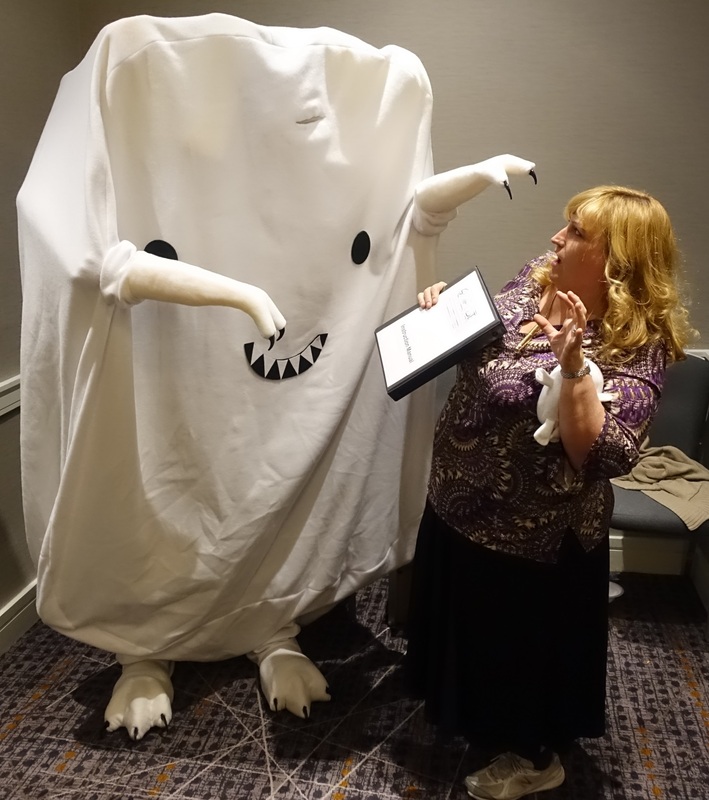 Adipose Rex – Very loosely based on the Doctor Who episode Partners in Crime, in which the Doctor and Donna investigate a diet scheme where the “fat just walks away.” This is what happens when you crank up the settings too high! Yet another Karval Kon costume that also appeared at Mile Hi Con 47, where it won a judge’s choice award. There are a few more details and pictures in this blog entry. 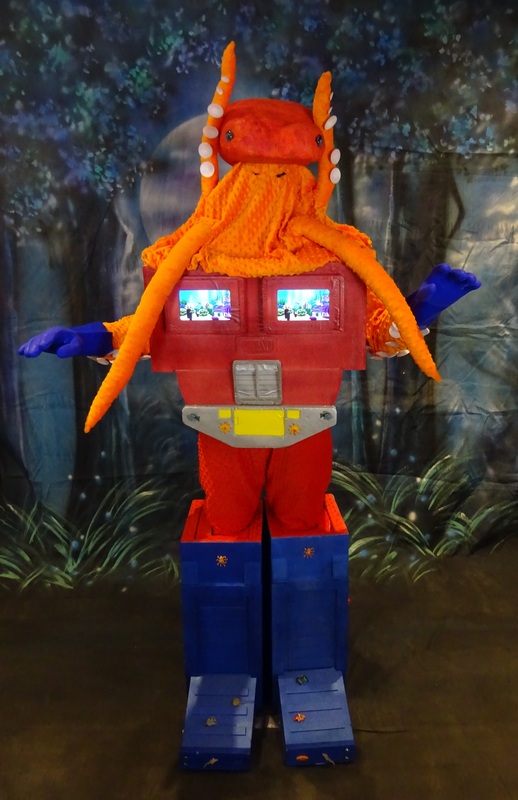 Octopus Prime – Optimus’ underwater cousin. Done to a dramatic orchestral version of the Transformers’ theme, which then fades into Under the Sea from The Little Mermaid. Tag line: I don’t think Michael Bay is even trying any more! Again, originally created for Karval Kon, but then fixed up a bit and taken to Mile HI Con 49, where it won a judge’s choice award (there’s always one suspect judge in every crowd). There are some more details in this blog post. 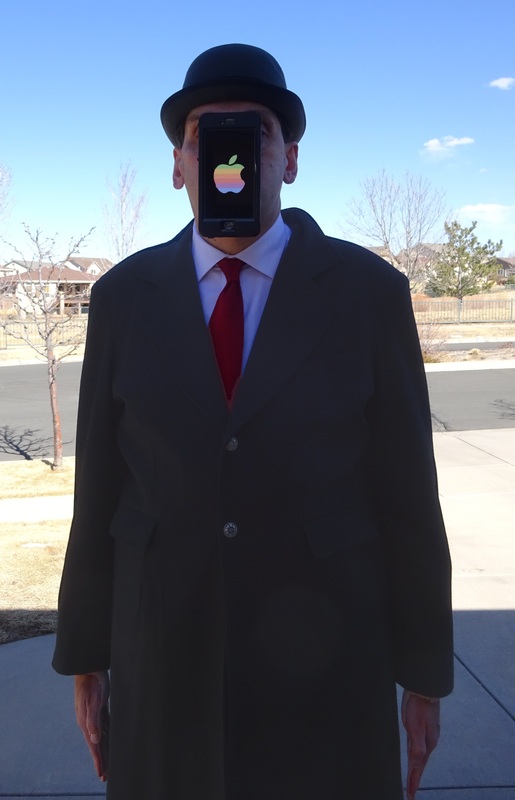 Grandson of Man – My take on Magritte’s Son of Man. Yes, yet another Karvel Kon Kreation. This was a quickie (most of the bits just came out of the wardrobe, which is a bit of a strange place), although I did have to buy the red tie. More details can be found in the blog post. Copse – Bad Trees, Bad Trees, Whatcha Gonna do? Another Karvel Kon special, with singing. Yes, we are dressed as trees, with the “Copse” logo on the back: Check out the blog post for all the gory details.